I received an email from one Mr. Manohar with a subject MIS LEADING ADVT IN TIMES OF INDIA. I was quite surprised to know that MASES had gained such attention. It really feels happy to know that now people are quite serious about the content of an advertisement. PEOPLE ARE NO MORE FOOLS (atleast quite a few of them). Though the impact sounds positive, I could not commit any action to this man. As we all have been seeing the kind of response from ‘Corporate’. However I appreciate Mr. Manohar’s effort and concern and I wish more and more awareness and dissemination should be encouraged in ‘watching’ the contnents of the Media. Please pay attention to the clarification given by ASCI. I Hereby Condemn TOI for publishing such classifieds and request more responsibility from them as media is considered as the fourth pillar of democracy! 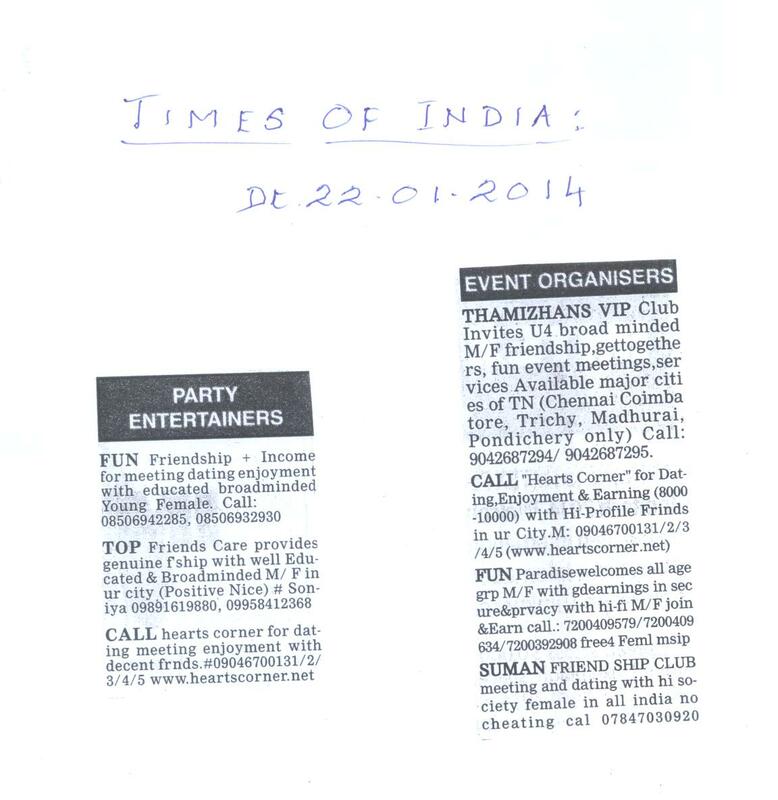 I wish to bring to your kind notice that for the past one year there were few advts coming regularly in Times of India news paper every day with the heading “PARTY ENTERTAINERS” & ” EVENT ORGANIZERS”. if you go through the ADVTS closely you will find out some thing is wrong. They advertise for “BROADMINDED FRIENDSHIP” they can enjoy & earn good income. If it is true friendship, then where is the question of money & income? These advts are spoiling the Tamilnadu culture severely. I wrote to TOI twice to stop such advts, but it is continuing with different heading which is really alarming. I even sent the scanned advt contents to COMMISSIONER OF POLICE but no action has been taken so far. Please investigate the issues and take action if something is wrong and try to ban such advts in TOI. I expect a word of reply from your end. It is nice to see your swift feedback which is very encouraging. Many thanks for your time. In spite of your busy schedule, you took some pain in replying and taking my complaint in a serous way. Keep up the good work. I have seen all your articles in the magazines. Great Job! I am forwarding you the mail sent to ASCI along with the ADVT contents. This is for your information and necessary actions, please. I thank you for your kind feedback regarding the above complaint. As suggested, I am enclosing herewith the Today’s TOI ADVT, scanned images for your kind reference. I request you to do the needful, before more & more youths falls in their trap. Thank you for writing to ASCI. We acknowledge the receipt your complaint. However we would require some more details to process your complaint. The advertisement description provided by you is inadequate. Kindly provide a brief description of the advertisement so that we can look for the specific communication. Please also provide the link/video/image of the advertisement Kindly provide the same by January 30, 2014. Assuring you of our services in the pursuit of Self-Regulation in Advertising Content. Thank you for writing to ASCI. We would like to clarify that ASCI’s mandate is to regulate only the content of advertising. The ad content does not appear to be in contravention of the ASCI Code. However, if these ads are advertising for something else in the guise of events then it appears to be a case of fraud and would not come within the purview of ASCI and would have to be reported to the relevant state authorities. In spite of my repeated complaints, nothing has happened from ASCI. Why can’t you persuade this case along with some Women’s Organisation? Did you check the contents of the Advt.? What is your opinion? I will be happy if you do justice based on your conscience. We should do something before more & more Tamilnadu youths get trapped through this advts. I saw the advt… It is unethical on the account of such newspapers to publish such advertisements inviting youngsters to make friendship and enjoy dating… When few Media puts all its effort in spoiling the younger generation it is a paradox that religious fundamentalists are always behind the ‘common man’…. I am sharing this conversation in my blog and hope to gain some attention..